Abstract, square-shaped biege jug with green and purple lines. Oxidised earthenware with matt lead sesquisilicate glaze decorated with inlaid coils of green stained clay; applied pieces; incised drawing and painted and sprayed underglaze colours. Blue, greens, red and purples. Slab-built from rolled sheets. Biscuit fired to 1150 deg. C; glaze fired to 1150 deg. 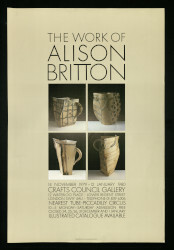 C.
Big Green Jug, Alison Britton, 1979, Crafts Council Collection: P235. Photo: Stokes Photo Ltd.